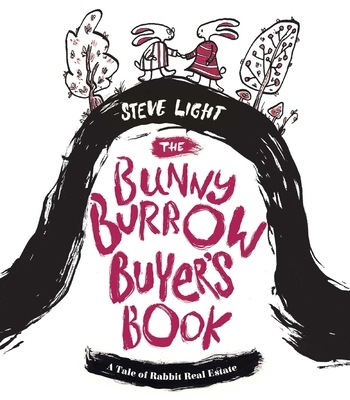 This saga of a swiftly increasing family of rabbits in search of a new place to call their own, rendered in exquisitely detailed artwork featuring cut-outs and gatefolds, is a perfect book for small children whose families are moving to a new home. Mr. and Mrs. Rabbit are having baby bunnies, and their burrow-for-two is just too small to accomodate a growing family. Time to call the forest real estate agent! As anyone searching for a new home must, the Rabbits look at a lot of different places, each one appealing in its own way, but none of them quite is right! Will they find the perfect new home to call their own? A single, black brushstroke that runs through the entire book provides a line that can be traced by little fingers from page to page, and anchors the detailed pen-and-ink style that Steve uses to show the forest homes and the creatures who currently inhabit them--the visible above-ground part of each burrow appears above the line, and the underground portion shows below the line. In addition, circular die cuts in each page allow a peek into the next burrow. With gorgeous artwork and exquisite production, this lovely little volume makes a fine gift for any new homeowner, and particularly for those with small children. Steve Light is the author of many best-selling children's books, including the Vehicles Go! series (Trucks Go!, Trains Go!, Diggers Go!, Planes Go! and Boats Go!, all from Chronicle) and Have You Seen My Dragon? (Candlewick, 2014.) Steve is a preschool teacher and professional storyteller who lives with his wife in New York City. "A droll, minimalist take on an odyssey that will be within the experiences of many children…and most adults."